So writes Second Circuit Judge Gerard Lynch in an opinion rejecting the innocent owner claim of Sharyl Davis. The case, previously discussed here, is an example of the Federal forfeiture power and pitted two seemingly innocent parties against one another. 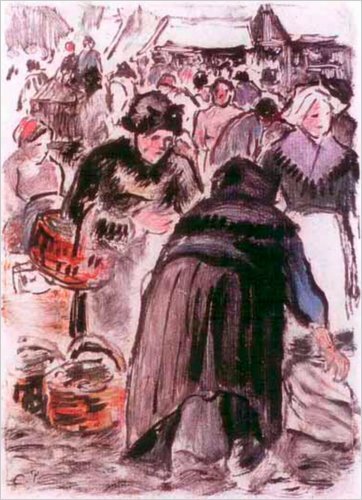 Ms. Davis, the loser in this dispute purchased this Pissarro monotype in 1985 for its market value, and had no knowledge that it had in fact been stolen from a Museum in Aix-les-Bains in France in 1981. Twenty years later the US government brought a forfeiture action against Ms. Davis when she consigned the painting to Sotheby’s for auction, but the Department of Homeland Security, after a request from the French police, asked that the painting be returned. It was this second sale which triggered a reaction, as the painting appeared in the Art Loss Register’s files—revealing perhaps some progress the art trade has made in uncovering stolen works of art. The case reveals the continuing preference of American Courts generally for the original owner. In this case Davis—who now runs a B&B in Anthony Kansas—was in the unenviable position of having to defend an action against Federal Prosecutors, for the wrongful activity of Emil Guelton. Even though Davis prevailed on two of three of the forfeiture actions brought by the government, she was unable to maintain possession of the work. And in fact, despite winning those two cases she was unable to recover attorney’s fees (which must have been substantial). Though CAFRA, a statute meant to ease some of the burden of defending forfeiture actions, does allow claimants to receive and award of attorney’s fees who “substantially prevail”, the material relationship with the painting was lost on one of the forfeiture claims, and Davis is left without a Pissarro and with a substantial legal bill. Kate Taylor, “Buyer of Stolen Pissarro Work Suffers Hefty Loss,” The New York Times, June 8, 2011, sec. Arts / Art & Design, http://www.nytimes.com/2011/06/09/arts/design/buyer-of-stolen-pissarro-work-suffers-hefty-loss.html?_r=1. United States v. Davis (2nd Cir. 2010).